The reasons are easily described with one word, 'life'. Both chief editor and graphic designer had to cope with some life issues, which kept us from being on time. This should not be an excuse, and we'll try to be on time with the summer issue. 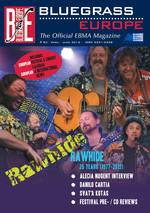 If you want a copy, make sure to join EBMA through this link; or subscribe here for Bluegrass Europe.